Legal, regulated sports betting is just a governor’s signature away from coming to Rhode Island. On Wednesday, the State Senate (by a vote of 34-2) passed a $9.6 billion budget package for Fiscal Year 2018-19 that included provisions for regulation of sports betting. The House in “Little Rhody” passed the budget last Friday night. Now all that remains is for Gov. Gina Raimondo to put pen to paper. July 1 is the drop-dead date to pass the budget plan, but lawmakers are optimistic it will happen sooner — perhaps by the end of this week. Earlier this week, USBets.com set odds on which state would be next to join Delaware and New Jersey in getting sports betting up and running, and Rhode Island was hovering just behind Mississippi and West Virginia, with odds placed at 4/1. Those odds will probably hold, as the preliminary go live date is a few weeks into the NFL season, with the aforementioned states planning to roll out by the first kickoff. The possibility of legal sports betting in Rhode Island opened up the instant the Supreme Court struck down the federal ban on such wagering (PASPA) back on May 14. According to the budget, regulation in R.I. will fall upon the Division of Lottery at the Department of Revenue. The number of betting windows will be limited, however — at least initially. Only the state’s two Twin River Casinos, in Lincoln on the northern end of Rhode Island and in Tiverton in the southeast (opening September 1), are expected to be able to host sports betting, and there is no framework yet for mobile wagering. According to Gambling Compliance, New Jersey projects for $55.3 million in sports betting at casinos annually, while Pennsylvania has a $73.9 million projection. With a population as of 2017 of just 1.06 million, Rhode Island has only 11.8% as many people as New Jersey (9.006 million) and just 8.3% of the population of Pennsylvania (12.81 million). Also, Rhode Island has a mere two casinos in the mix, whereas Jersey is expected to house about 10 operators and Pennsylvania is home to 12 casinos (with a 13th, Live! Hotel & Casino in South Philly, coming). So why does the budget presume “The Ocean State” will generate 42.5% of the profit NJ expects and 31.8% of what PA could rake in? The $23.5 million figure comes from a projection of $910 million in handle, and Department of Administration spokeswoman Brenna McCabe told the Providence Journal that the estimate was arrived at without any input from consultant Spectrum Gaming Group. Governor Raimondo initially proposed that the state keep 61% of net revenue, but the budget bill has lowered that number to 51% (with 32% going to international gaming giant IGT, which will presumably run the sports-betting operation, and 17% going in Twin River’s coffers). So how did the $23.5 million figure remain the same? McCabe explains that initial projections were based on adjacent Connecticut and Massachusetts providing sports betting competition. Neither state is on pace to beat Rhode Island’s projected October start date, which means more visitors from out of state are expected to drive to Lincoln or Tiverton to put their money up. Can Rhode Island “handle” competition? Surely, there will be tourists and folks from neighboring states venturing into Rhode Island and adding to the betting handle. But enough to get the state all the way to $23.5 million in revenue, three-eighths of the way to NJ’s projected land-based total? It seems the eyeglasses have a rose-colored tint in Rhode Island. Especially considering Rhode Island was recently ranked last among the 50 states as a summer road trip destination. Whatever the state is going to get, handle-wise, out of residents of nearby states, it had better get it soon. 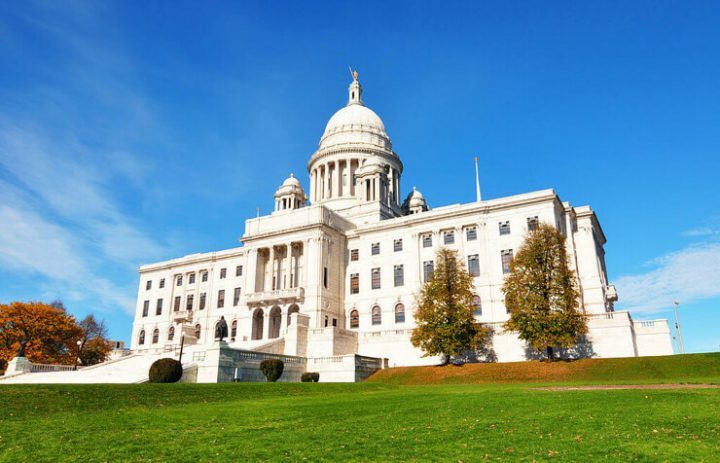 With Rhode Island moving forward, the urgency just got a lot higher for lawmakers in Massachusetts, who’ve been studying the issue of sports betting, to get their own regulations on the books. And that might prove the most lasting legacy of Rhode Island passing sports betting legislation: It could be the domino that gets the rest of New England tumbling.